Savory roast beef. Zesty horseradish. Buttery round crackers. Put them all together and you've got spicy bites for three, ready to eat in 5 minutes! 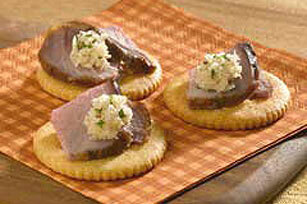 Top each cracker with 1 roast beef piece and 1/4 tsp. horseradish; sprinkle lightly with parsley. Garnish with cherry tomato wedges just before serving.